After her dad is killed by one of his workers, his 14 year old daughter discovers that the authorities have no intention of hunting down his killer. So she hires a rather old Marshall with a reputation to track the murderer down. They are joined by a younger Marshall after the same man for different reasons. Together, they journey into the Indian territories for the showdown. The previous filmed version of this famous novel won John Wayne his only Oscar. 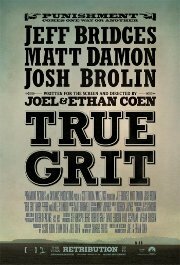 This version is one of the top contenders for the 2011 Oscars. Comments Moderate moments of violence, occasionally a bit gruesome.